So, you’ve seen those large, green avocados at the grocery store — Florida avocados, or Dominican avocados — and wondered what the difference is. Are you missing out? The Florida avocado has some great uses, but the Hass avocado makes more sense for most culinary purposes. The big difference: Florida avocados have significantly less fat. Now, less fat might sound good, but the fats found in Hass avocados are actually very healthy. Avocado oils are considered heart-healthy and good for your skin. Florida avocados have the same kind of fats but in much lower quantities. In terms of cooking, the fatty Hass avocado cannot be beat. The richness of the fruit makes the Hass easy to mash and whip and richer in taste. For guacamole, avocado toast, warm pesto sauce, or a healthy fat component in baked goods, you really need the Hass avocado. The Florida avocado may be superior in just a few cases — namely, when slicing and dicing for salads. The firm, low-fat flesh holds its shape when you toss cubes of it into a salad, for example. And if you are adding olive oil, nuts, or other healthy fats, perhaps you might be interested in cutting calories by using the Florida variety instead of the Hass. Try a Florida avocado and you’ll see what we mean. It’s easy to slice and handle, but has a watery taste compared to the Hass. 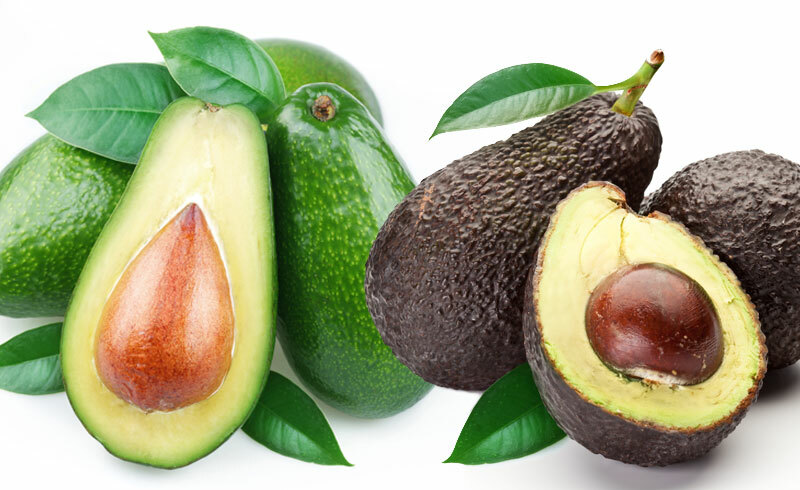 Florida vs. Hass Avocado: What’s the nutritional difference? If you eat an entire Florida avocado, you’ll be consuming many more calories than you would with one Hass avocado. Bite for bite, the Florida variety has a bit fewer calories. One cup of Florida avocado has 276 calories and 23 grams of fat. One cup of Hass avocado has 384 calories and 35 grams of fat. Not too much difference there, right? Except that you may end up eating a larger portion of the Florida avocado because it lacks the richness and taste. That can mean more calories yet fewer healthy fats. Ultimately, the Florida avocado has some unique possibilities thanks to its firm, low-fat texture. For that creamy, healthy goodness that we all expect from an avocado, however, Hass is king. This entry was posted in All about Avocados and tagged Florida avocado, Hass avocado.